The beauty of finding a round piece of wood is that someone else cut it for me, perfectly round. I could have spent nothing on some cardboard or whatever, but the imperfect circle would cost me peace of mind. Once I found that round, I looked for wooden dowels and started sketching out the various sizes. I picked a dowel size, counted out how many dowels I thought I’d need, and doubled that number. Just to be sure. To make the starburst, I cut the dowels in half. I drew a circle on the back of my wood round as a guide, tracing a small plate, and marked even quadrants of the circle. Then I started gluing, trying my best to glue one dowel to each quadrant at a time. My goal was to place the dowels as evenly as possible, with mixed success. This thing turned out to be roughly 5 feet wide and tall. Carrying it outside to spray paint was comical because I didn’t open the doors for myself before I picked it up. I used two cans of silver spray paint over about 3 hours of painting. Those skinny dowels eat up a ton of spray paint. Traditional paint may have been the better option to waste less paint, but I’m not sure how I’d get total coverage. I already had the spray paint, so that’s why I used it. Once the paint was dry, I cut a rough circle out of a bag to create a backing for the starburst. I screwed in two eye-loop things … the metal things you get in the picture-hanging kit. I strung the wire from said picture-hanging kit between the two loop things, and hung the beast on the biggest blank wall we had. After some discussion about placement and repeated measurements, I centered the starburst horizontally between the crown molding and the hight of the table. Weeks later, we installed (and by “we installed,” I mean I picked it out and Jeff did all the actual light hanging and electricity connecting) the new light fixture! Since buying our home last May, Jeff and I have tackled a wide variety of projects together and separately, none of which I have taken the time to document yet! But this cute little bench for the entry is something I always thought I’d be able to do, but have never attempted making actual furniture. I knew the rough dimensions the hallway would accommodate, and then wandered through Lowes and surfed Amazon to see what materials were available. I found a “craft board” made of pine in dimensions that would work, similar to this appearance board. Mine is 4 feet long by 16 inches wide. I also ordered the hardware that attached the legs at an angle. Turns out, 11 degrees is the magic number to make the legs look like that, which I did not previously know! At my husband’s suggestion, I attached the legs to a spare piece of 2 by 4 to stain them. Amazon also had tons of foam options to cover the seat — I went with 5-inch memory foam that came vacuum packed in a relatively small roll considering it unfurled to about 6-feet long! We put the hardware for the legs on first because Jeff wanted to make sure they were extra secure. Then I wrapped the whole thing like a Christmas present and used my staple gun to assemble the bench. It’s alright to be right, but it’s nice to be nice. Like most of the important lessons in my life, the I’ve carried around the Nice Lesson for years. What is the Nice Lesson? To me, it’s how to balance one’s personal need to be right with the moral and social imperative that human beings treat each other with kindness. I’ve lived on both ends of the spectrum — the need to be right fits in nicely with my perfectionism, but always being nice plays right into my abhorrence of confrontation. I think my struggle to live in a balance with the two is why I am so sensitive to something that’s probably not even a thing for most people. Right off, though, I’ve got to say that I don’t think that a person can’t be nice AND right. I think this is an issue of the Golden Rule. We recently held national elections, and I’m not even going to pretend that the current political climate didn’t affect me deeply. Full disclosure: My political convictions range all over, but socially I’m progressive. This year I’ve been called “unpatriotic,” “baby killer,” “socialist,” “retarded,” and plenty of other hurtful, thoughtless things. I’m none of those things. I am not ANY of those things. This election, however, I had to go with the Golden Rule. I was raised on the teachings of Jesus and the importance of thinking critically and acting accordingly. Instilled in me is a deep patriotism. As a result, I vote with my conscience. I vote the Golden Rule. Unrelated to my personal election season experiences is the another bit of the Golden Rule. I witnessed a grown man yell at a 16-year-old girl about whether her mobile devise had an app on it or not. I experienced a first-hand scream-down over a movie time. Really, dudes?! Why is your need to be right more important than the imperative to be kind? To be loving? To reassure people you love?! I am a technology-savvy marketing and communications professional with project management experience, as well as a copywriter and award-winning editor. I know how to evangelize a brand or message, especially in a B2B environment. I’m fiercely loyal, passionate, and always interested in how stuff works. I bring a keen eye and sense of humor to everything I do and everyone I meet. I’m passionate about learning and edifying. I’m a voracious reader and enjoy creative projects in my downtime like crafts, DIY, and knitting. (Yes, Pinterest was built for me!) I like to blog, which is a byproduct of what I call my rich internal life. I also enjoy being a part of the Sparked.com microvolunteering network. I recently joined Peisner Johnson & Company as marketing manager. PJCo is a registered CPA firm focusing exclusively on state and local tax issues. Our headquarters are in Dallas, and I divide my time between the Dallas and Waxahachie offices. Writing + dreaming = great advice! 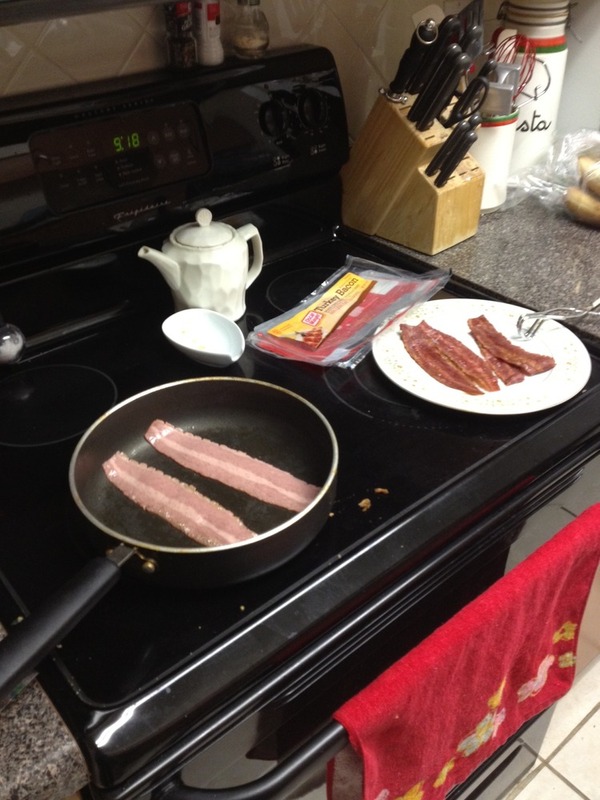 I can bring home the bacon, and fry it up in a pan! I cannot cook bacon in a pan, turkey (my bacon of choice) or otherwise, without singing the jingle from the popular commercial from my childhood. Exhibit 2: Popular commercial from my childhood. Yesterday, my friend Angela and I were discussing life, et cetera, and she said I was one of the most progressive people she knows. I suppose she’s right; I am progressive. I’m progressive because of my upbringing, my family, my personality, the path I’ve taken, the purpose divined for me. Of my parents, it is my mother who has the Bachelor’s degree. Of my father’s parents, it is my grandmother who was the PhD. My great aunt Isobel was the first female full college professor at Michigan State University. She eventually became the head of MSU’s math department. (The first woman to become a full professor at Michigan State taught calculus — not home economics, elementary education, nursing, or any other traditionally female-dominated profession. Great Aunt Isobel taught MATH.) My mom’s mom was a tailor (She called herself a seamstress, but she tailored wedding dresses. That’s a tailor.) with a sharp eye for detail and passion for her work. My sister and I discussed this a couple of days ago. In addition to these female examples, our dad is a driven, successful trailblazer. What option did we have but to seek challenge and create compassion?! I’m so excited to be in a role professionally that is challenging, new, fun, and different than anything I’ve done before. I didn’t realize that these were qualities I needed in a career until I spent time with a career coach. I’m happy to be in a relationship that supports and celebrates my career. I’m grateful to have friends and family who share my professional ideals, ambitions, and successes. I took that surreptitously one-handed while trying to play it cool when what I really wanted to do was tackle-hug him while squeeing from a dead sprint. His talk was based on his book, Enchantment, in which he discusses building enchantment around a brand. I learned a lot from the talk, and I’m looking forward to reading the book to reinforce the ideas! A lot of what I learned tonight didn’t come directly from the speakers. I’m not really on the front lines with clients for now, so my perspective on enchanting customers is different, for now. I’m synthesizing Guy’s information with what sparked in my mind. Frankly, I’m enchanted by all the inspiration. I will post more about all of it soon! Will you please tell me about yourself? Frankly, I’ve had so many interviews lately that I am sick of talking about myself. But starting a new position this week, I’m making every effort to embrace the two-ears-one-mouth policy. As in, listen at least twice as much as you speak! Supporting this attitude is the fact that I am, once again, working in an industry that is new to me. I am very happy, once again, to have an exciting challenge to learn and write about brand-new topics. When I was in B2B publishing, we used to say, “a good writer can write about anything,” and I really believe that’s true. It’s true with writing, marketing, and sales. My friend Jason says that the less a sales person understands what they are selling, the better they do. I disagree somewhat — I would say that it’s not about understanding, it’s about technique. A sharp professional who has the technique can come to understand a new industry and it’s subtleties. But guess what … relying on all technique and no understanding is an ego-driven, naive, greedy, or just plain stupid move — that person will fail because he or she is egotistical, naive, greedy, or stupid. Thus, the two-ears-one-mouth policy! What is happening in my brain during all this two-eared policy is interesting, exciting, and totally exhausting.